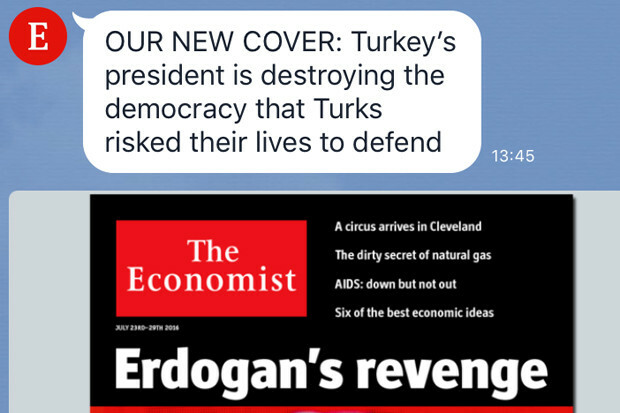 About one year ago, The Economist's editorial social media team was expanded from two members of staff to ten, with the goal to solve two main problems: get The Economist in front of people who have never heard of it before, and make it clear to those who have that the media organisation covers more beats beyond the economy. As part of its new social media strategy, The Economist ran an audit to identify its strengths and weaknesses on social, explained Denise Law, community editor, in a Medium post published on 25 July. "We were spending too much time writing tweets for section accounts that generated little traffic and engagement," she wrote, explaining these resources were then reallocated to different platform such as Line. "For some of our Twitter sub-accounts, our audit showed that it would take between a decade and seventeen years at their current growth rate to reach 100,000 followers," Law told Journalism.co.uk. The Economist's investment into social media has resulted in an expansion of its social following of 55 per cent year-on-year, and a 40 per cent growth in unique visitors from social media in the same period (June 2015-2016). One of the main challenges Law had to work through, but that ultimately became one of the key drivers of The Economist's success, was getting the rest of the newsroom on board. "We've had pressures from changes in the digital publishing industry, but the pressures have been different because we are a weekly," Law told Journalism.co.uk. "We haven't had to worry about filing more stuff online because producing a daily print product is much more expensive. "But at the same time, there have been people who were sceptical about why we should invest in a social media team, so the past year has been a lot about cultural change as well. "People started to realise that younger audiences might not necessarily consume the print content and you need social media to help you get new audiences and new readers. "People now accept it, they accept that it's important. And not only do they accept that, many of them embrace it." Brexit coverage ahead of the EU referendum in the UK proved to be a good opportunity to further entrench a collaborative workflow in the newsroom, getting the social media team working closer with the editors, correspondents, designers and developers to build new formats and templates. Myth busters and #BrexitFacts emerged as successful templates, and got more and more popular as the referendum date approached. Law explained the idea behind them was to cut through the noise on social media, and offer people a quick piece of information that would leave them feeling smarter after reading it. They also served as teasers to get people back to The Economist website for more information. To show editors and correspondents the efforts to experiment on social media were worth the resources, Law made sure the team is open about involving others in the newsroom with its work, and highlight the successes. "It’s not enough to blow stuff up in a corner and hope someone will notice your efforts," she wrote on Medium. Now that the referendum has come and gone, the social media team plans to apply the takeaways from its Brexit coverage to the way it will approach the US elections. Continuing to use data to discover the platforms and formats that match better and should be prioritised, as well as templates for snack-sized piece of information on social, remain points of focus. But the lesson that tops all others, as the outlet plans to focus on the quality of its output rather than the quantity, is to "collaborate with editors and correspondents in the conception stages of a story," Law said. "Last year or even before the editorial social media team came into existence, it was 'I've already written my story, you go promote it'. "That doesn't really happen anymore. Obviously they still write the story that goes into print. But now we proactively go speak to editors and correspondents to think about ideas that would be optimised for social media. "[It's] collaboration, but at the conception stages of a story – co-creation collaboration."